Following on from our sadaqah jar, we have decided to do a good deed jar. This will be perfect as Ramadan is coming up and I will be making up a list of good deeds to do (which I will also share), but this isn’t just for ramadan but can be a daily thing. Firstly you need to make the jar. 1 jar (we used an old homepride jar which had pasta sauce in it). 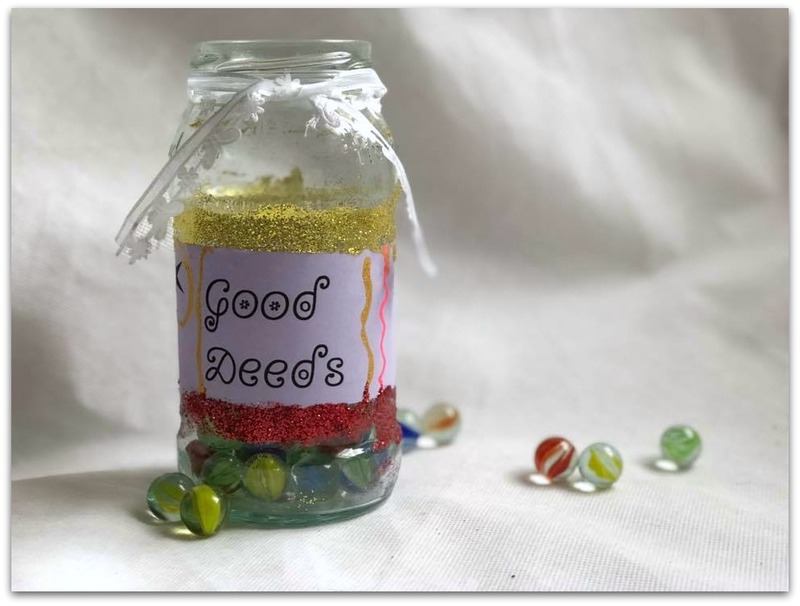 I decided to print off the words Good Deeds and stick that on the jar but there is nothing to stop you with writing the words on the jar if you have pens that are able to write on glass and can be clearly read. Then just leave the jars to the kids to decorate them in any way they want. For daily use the jar will be empty. And as the girls do a good deed then they can add a marble to the jar. 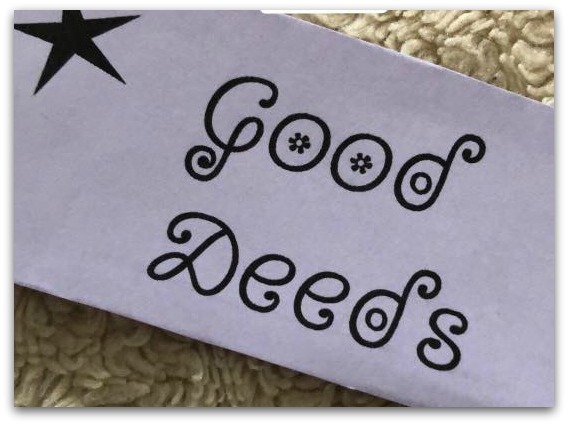 The deeds can be as simple as helping each other do something, tidying up without being asked to, feed the cat…..
What we will also do is make a lost of possible good deeds and for each deed it will be rated, so the more involved the deed is the more marbles it will be worth. 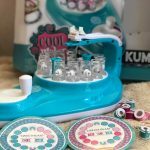 You can personalise this to your child….my eldest at the moment is at that pre teen stage where she is a bit grumpy and quite happy to just sit in her room and read….so even the smallest thing such as helping her sister will come under the good deed list. Once the jar is full to the top with marbles then they can get a treat which will be their choice. We decided to do only one jar as I didn’t want it to end up being a competition between the two and that was the only reason they were doing good deeds…I also want them to work together. With a 6 year age gap between them they often clash and this could be a good way to bring them together. For Ramadan the jar will be filled with 30 deeds which they will pick and do each day in sha Allah! We may just make a separate jar for Ramadan. 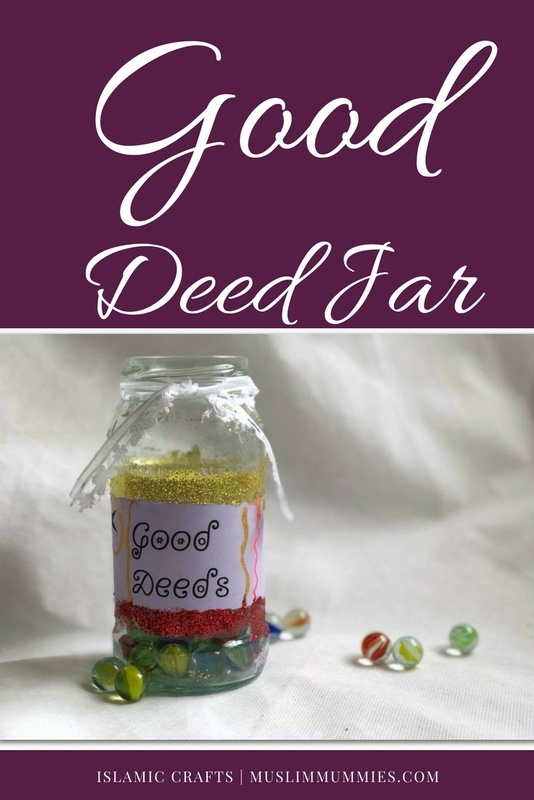 Why A Good Deed Jar? 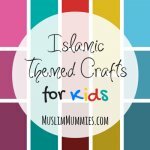 Kindness is so important, and the jar in sha Allah will aid in teaching them to be kind and helpful towards each other and to others around them. Yes they may initially be doing it for the reward at the end, but it will also help get them into the habit of doing things for others as well. Do you have a good deed jar for your kids? That’s such a great idea Mashallah! Thank you! Seen it on Pinterest a number of times so thought we would do it too. Masha’Allah I love this idea! Going to give it a try …. I like the “without being asked” bit. Masha Allah, I love this, I especially like the way you use marbles instead of money. All my children are grown now but will share this with my daughter so she can think about implementing it with my grandson. Masha’Allah, I haven’t seen one like this before. I love it! Insha’Allah I will stop recycling jars for a while so I can reuse them for this. Jazakillahkhayr. 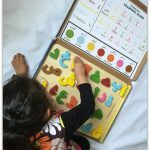 This is a really nice alternative to a sticker chart and it looks pretty too and gets the kids involved. 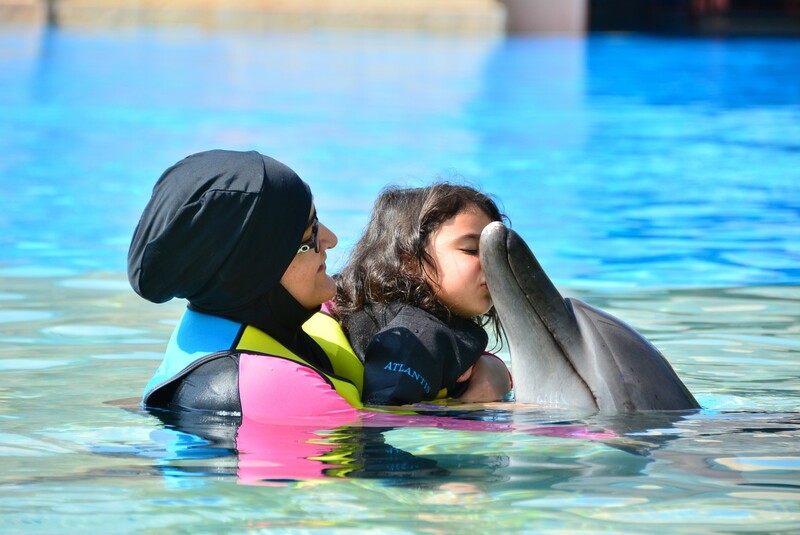 My daughter is still young but it is definitely something to do in the future. Wow excellent idea…..My mother used to give red star on our hand for the good deeds and black star for bad deeds…. This is such a good idea. I love that you choose to use only one jar instead of two so that your daughters work together, it s wonderful idea. I might try this for myself but with money. Another good deed idea- give mum a back rub or foot massage, just saying ;D. MashaAllah! What an excellent idea I especially love that it keeps the two working together hand in hand. My kids all grown up but I will share this idea to my daughter. 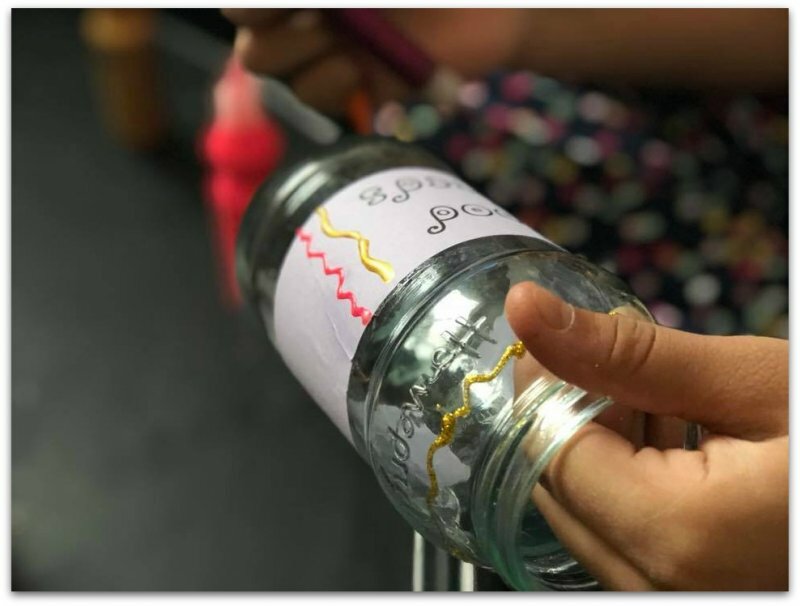 I think this good deed jar will work wonders for my grandson who is dyslexic and needs lots of encouragement to fulfill even the simplest of chore. Masha’Allah this is a great idea! Might make something similar for my younger sister. She’s been using a sticker chart for good behaviour but she might prefer this. Masha’Allah, I love it! Insha’Allah I will stop recycling jars for a while so I can reuse them for this. and one thing i love this idea.